Steven Leonard Jacobs joined the Department of Religious Studies as Associate Professor and Aaron Aronov Chair of Judaic Studies on January 1, 2001 and received tenure as of August 2004 and was promoted on Full Professor in 2017. He received his B.A. from Penn State University; and his B.H.L., M.A.H.L., D.H.L., D.D., and rabbinic ordination from the Hebrew Union College-Jewish Institute of Religion. A resident of Alabama for more than three decades, he has taught at Spring Hill College, Mobile; University of Alabama at Birmingham, Birmingham-Southern College, Samford University, Birmingham; the University of Alabama in Huntsville and Calhoun Community College, Huntsville; as well as serving congregations in Birmingham, Mobile and Huntsville. 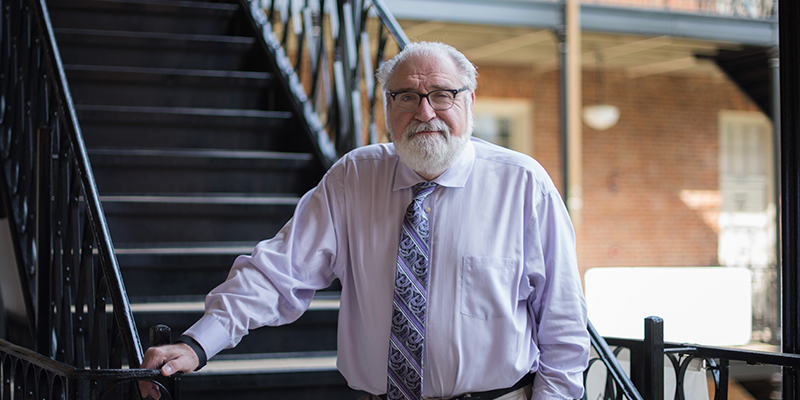 Dr. Jacobs’ primary research foci are in Biblical Studies, translation and interpretation, including the Dead Sea Scrolls; as well as Holocaust and Genocide Studies. His books include Shirot Bialik: A New and Annotated Translation of Chaim Nachman Bialik’s Epic Poems (1987); Raphael Lemkin’s Thoughts on Nazi Genocide: Not Guilty? (1992); Contemporary Christian and Contemporary Jewish Religious Responses to the Shoah (2 volumes, 1993); Rethinking Jewish Faith: The Child of a Survivor Responds (1994); The Meaning of Persons and Things Jewish: Contemporary Explorations and Interpretations (1996); The Holocaust Now: Contemporary Christian and Jewish Thought (1997); The Encyclopedia of Genocide (2 volumes, 1999, Associate Editor); Pioneers of Genocide Studies (2002, Co-editor); and The Biblical Masorah and the Temple Scroll: An Orthographical Inquiry (2002); Dismantling the Big Lie: The Protocols of the Elders of Zion (2003); Post-Shoah Dialogues: Re-Thinking Our Texts Together (2004). His professional and civic involvements include the Alabama Holocaust Commission; Board of Advisors, The Center for American & Jewish Studies, Baylor University, Waco, TX; International Editor, The Papers of Raphael Lemkin; International Advisory Board of the Centre for Comparative Genocide Studies, Macquarie University, New South Wales, Australia; Editorial Board, “Studies in the Shoah,” University Press of America, Lanham, MD; Editorial Board of Bridges: An Interdisciplinary Journal of Theology, Philosophy, History and Science, Monkton, MD; Educational Consultant to the Center on the Holocaust, Genocide, and Human Rights, Philadelphia, PA; Board of Advisors of The Aegis Trust for the Prevention of Genocide, England; and Secretary-Treasurer of the International Association of Genocide Scholars. What’s the Backstory on Prof. Jacobs…? Read up on the Department of Religious Studies’s minor in Judaic Studies. Read Prof. Jacobs’ report from his week at a workshop sponsored by the U.S. Holocaust Memorial Museum.